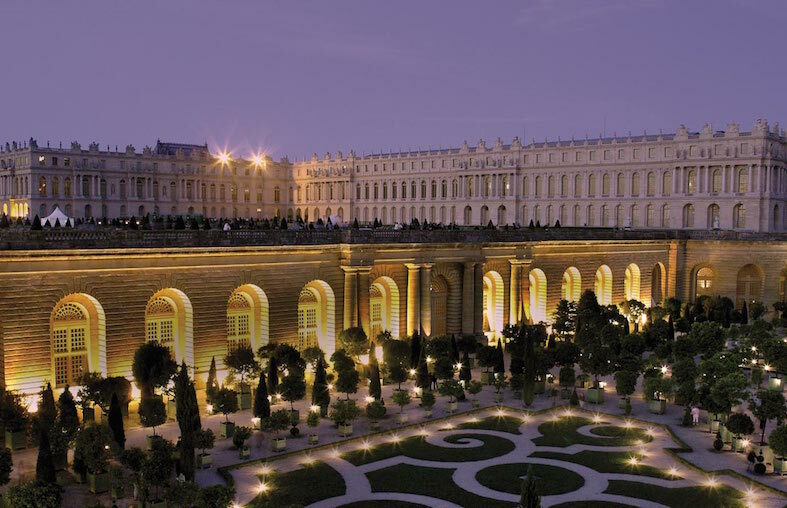 One of the world’s most visited monuments, the Palace of Versailles is place which conjures images of grandeur and excess, pomp and controversy. King Louis XIV transformed this former hunting lodge into a magnificent palace which served not only as royal residence but as the seat of France’s government. At the heart of this was patronage of the arts. Alongside art and theater, music was a means to both entertain those at court and promote the glory of France and of the monarchy. Though the days of the court are past, Versailles is still the setting for classical concerts in the same spaces where the Sun King and his successors once reigned. The Hall of Mirrors at Versailles is one of the most dazzling chambers in the palace. This 73-meter long gallery features seventeen mirror-clad arches reflecting the light of seventeen garden-facing windows. At the King’s insistence that all decorative items for Versailles be French-made, the 357 mirrors were all manufactured in France at significant cost and effort despite the Venetian Republic’s manufacturing monopoly. Louis XIV made use of the Hall of Mirrors on a daily basis on his way from his private chambers to the chapel. This central gallery was naturally the setting for festivities of extraordinary opulence including royal weddings and splendid parties. For a taste of life at court, embark on the Royal Serenade, which guides visitors through court scenes both whimsical and grandiose. Designed between 1661 and 1700 by Andre Le Nôtre, these sprawling gardens to the west of the palace are arguably one of the most famous in the world, and certainly one of France’s most visited sites. The grounds are so expansive as to demand an entire day’s exploration in their own right. Here you will find carefully manicured parterres and ornamental groves as well as abundant sculptural allegory throughout. The many pressurized fountains were designed to highlight the dramatic compliment of art and technology, though problem supplying water made their use problematic at the time. This difficulty has been resolved today, and visitors can enjoy the artistic (and hydraulic) wonder of the fountains to the accompaniment of fine Baroque music and fireworks over the Grand Canal. The King sat in the tribune of the Royal Chapel for daily low mass, where each day the choir sang a new work by composers like Lully or de Lalande. The chapel was de-consecrated in the 19th century, and today visitors can enjoy sacred music concerts by the Baroque masters in a space steeped in history. Theater and the arts played an important role in French society, not only in terms of entertainment but as an expression of power—see Louis XIV’s playing the allegorical role of the Sun King. Versailles saw the operation of several temporary theaters over the decades before construction of the Royal Opera under Louis XV. At the time, it was the largest live performance theater in Europe, and it led the way with it’s a combination of classicism and innovation. Superior acoustics owe in part to the wood interior, which painted with a faux marble technique and punctuated by gilding, trompe l’oeil, mirrors, and twinkling chandeliers. The venue can serve as a theater or as a ballroom, thanks to a mechanism (that is still functional today), which doubles the floor space by raising the orchestra level to match the stage. Today, the Royal Opera of Versailles concert season will transport audiences back to the glory days of theater at Versailles.